In 1974, the city of Hamburg proposed to build a new underground line to link the large public housing estate “Osdorfer Born” to the inner city. This underground line has never been built, yet it is a much discussed topic by Osdorfer Born inhabitants. It puts them into action. Osdorfer Born has its own underground line, although it is not running. It is my motif to do research on this issue because the missing running underground line bothers me due to both the trouble of getting there and the city of Hamburg not being able to provide a decent link to the inner city for Osdorfer Born inhabitants. 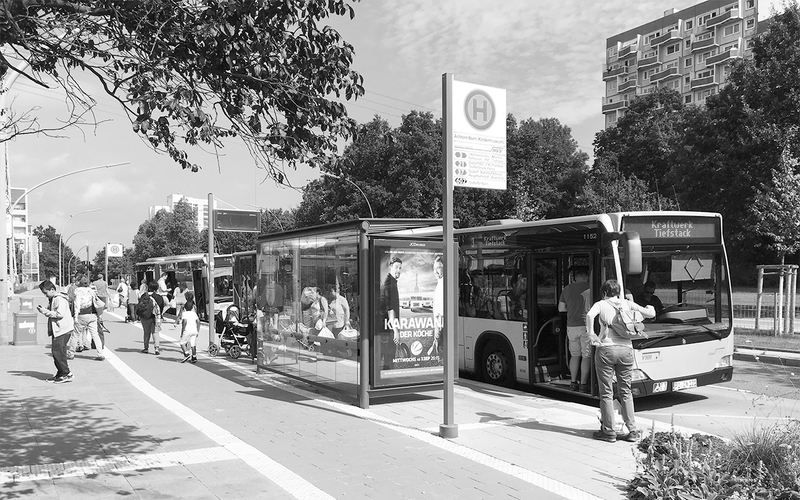 My research question is: How does the presence of absence of a proposed underground line which has never been built inscribe itself into the urban situation at a central bus stop in Osdorfer Born? To access and discuss my data and to situate myself in my research domain, I approach Osdorfer Born by doing a situational analysis (cf. Clarke 2005). I follow associations in an actor-network (cf. Latour 2006) to show why the “Achtern Born (Kindermuseum)” bus stop serves as a key actor in this urban situation. Traces of the proposed underground line are to be found here. I then activate this network of associations (cf. Kromrey 2009, Denzin 2007, Füllner 2014). Based on collected, examined and analysed data I perform an intervention at this bus stop. It puts human and non-human actors into action and thus opens up possibilities to engage with the urban situation. I cover the bus stop‘s glass walls with post-its which ask questions like “Where is the underground line?”; “When will the underground line be built?”; “When will the underground line be running?”; “How will the underground line be running?” and invite inhabitants to discuss these questions. Analysing my data by means of Grounded Theory coding (cf. Strauss; Corbin 1996) generates five key themes of this urban situation. First, Osdorfer Born has its very own identity which is being distinguished heavily from other districts‘ identities. Second, Osdorfer Born is in need of a running underground line. Third, the past and the future are brought together in the present. Fourth, “the others” are to blame for the fact that the underground line is still not running. 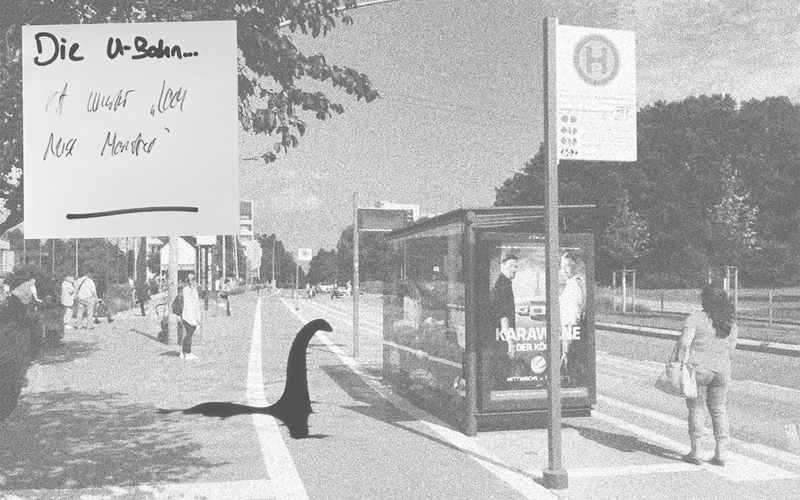 Fifth, the underground line is Osdorfer Born‘s very own Loch Ness Monster. Clarke, Adele E. (2012): Grounded Theory nach dem Postmodern Turn. Wiesbaden: Springer VS.
Denzin, Norman K. (2007): Symbolischer Interaktionismus. In: Flick, Uwe et al. (Eds.) (2007): Qualitative Forschung. Ein Handbuch. Reinbek: Rowohlt Verlag. 136-149. Füllner, Jonas (2014): Aktivistische Stadtforschung. In: Belina, Bernd et al. (Eds.) (2014): Handbuch kritische Stadtgeographie. Münster: Westfälisches Dampfboot. 86-91. Kromrey, Helmut (2009): Empirische Sozialforschung. Stuttgart: Lucius & Lucius. Latour, Bruno (2006): Die Macht der Assoziationen. In: Belliger, Andréa; Krieger, David J. (Eds.) (2006): ANThology: ein einführendes Handbuch zur Aktuer-Netzwerk-Theorie. 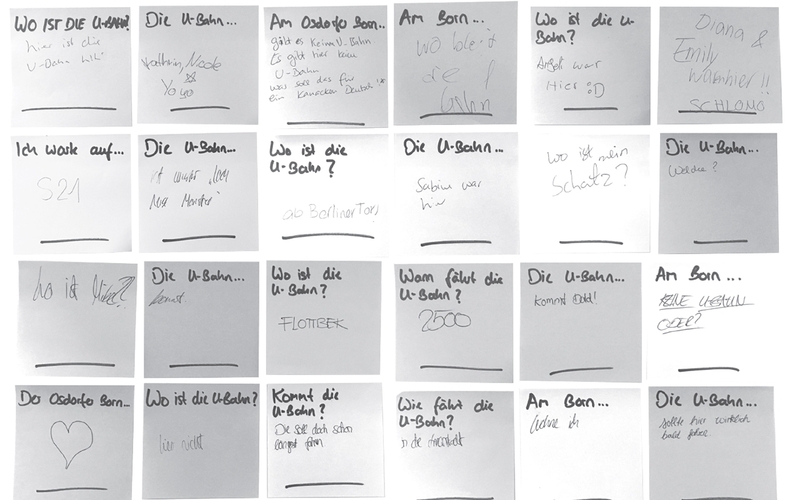 Bielefeld: Transcript-Verlag. 195-212. Strauss, Anselm; Corbin, Juliet (1996): Grounded Theory. Grundlagen Qualitativer Sozialforschung. Weinheim: Beltz.